Top: Manor College President Jonathan Peri and Delaware Law Dean Rodney Smolla seal the agreement. Bottom: Dean Smolla presents mock argument to students, administrators, and faculty at Manor College. Manor College and Widener University Delaware Law School have entered an articulation agreement that will give Manor students the opportunity to earn an accelerated Bachelor’s Degree from Manor and a Juris Doctorate degree from Widener University Delaware Law School in a recently-announced 3 + 3 program. Delaware Law Dean Rodney Smolla and Assistant Dean for Admissions Barbara Ayars visited Manor’s Jenkintown, Pennsylvania, campus for the formal articulation agreement signing on December 3rd, 2018. 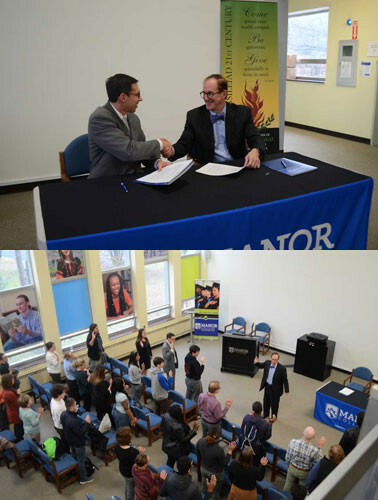 Manor College President (and Delaware Law School alumnus) Jonathan Peri and Dean Smolla signed the agreement which also guarantees admission to Delaware Law School for Manor College students who complete their Bachelor’s Degree at Manor before applying to law school. After the signing ceremony, Dean Smolla presented a mock US Supreme Court oral argument to 50 students, administrators, and faculty who gathered to see the lively, interactive session that examined a mock case scenario creating a hypothetical of a group of Division 1 football players at a State University taking a knee during the National Anthem in violation of school policy that requires all athletes to stand during the playing of the National Anthem. Dean Smolla swore in the students at the presentation as Supreme Court justices for the day. The students were engaged and took their roles seriously by vigorously posing questions to Dean Smolla during the oral argument as he played the role of counsel for the university, as well as counsel for the football players. Several students remained after the presentation and spent time discussing the case scenario and First Amendment case law with Dean Smolla.